THE BANNED LECTURE is a unique discourse by Crowley ostensibly in defence of the notorious Giles De Rais, a mediaeval Magician who has been variously accused of killing between 100 and one thousand children in Satanic Rites. Is that what Satanists do? Of course not. In reality the execution of Rais on 26 October 1440 by an Ecclesiastical Court was as much due to political intrigue and the beginnings of The Burning Times (witchcraft mania ) than to any firm evidence of the alleged atrocities. The accusations have resurfaced in modern times and many otherwise sensible commentators have fallen for the lies about Rais including some historians who hold that the crimes actually did occur. 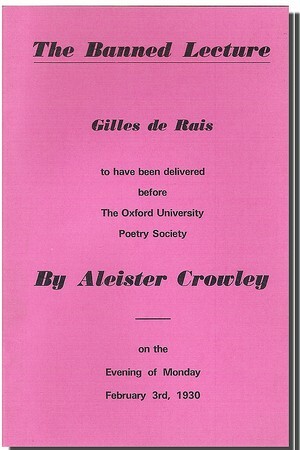 But Crowley knew that Giles de Rais' case had been a classic example of the suppression of knowledge by a theocracy and was making ready to tell the Oxford University Poetry Society the truth on Feb 3rd 1930. His lecture, printed verbatim in this pamphlet, was in reality an attack on the Establishment and an explanation of how the Orthodoxy had always suppressed free thinkers. So penetrating were these conclusions that Father Ronald Knox, the University's Catholic Chaplain, succeeded in banning the lecture at the last minute. This did not frustrate Crowley who immediately had the lecture printed and distributed as you see it in this book. The relevance of Crowley's BANNED LECTURE to modern issues of religious freedom is astounding. His conclusions are of immense importance to all esotericists. The strategy that the Establishment used to persecute and execute Giles de Rais on charges which are still unclear 500 years afterwards are the same ones which their modern counterparts employ to create mind-control mechanisms in the mass media today. The need for Knox to suppress Crowley's comments about Rais have their parallel with the fundamentalists wish to ban Crowley's books today. Crowley's BANNED LECTURE has become his 'defence from the grave'. Seventy years after the event the spectre of Crowley's BANNED LECTURE reappears again to smite the lies and contradict the conclusions which snipe nosed bigots thought they were safe in asserting. When you read THE BANNED LECTURE and see what 'The Wickedest Man in the World' really thought about Black Magic and Satanism you will see that Crowley has managed to confounded his critics 'from the grave'. This printed edition is only obtainable direct from the S.A., This rare treatise also includes a biography of Giles de Rais and the situation leading up to his execution. An absolute snip for Thelemites, esotericists and folk-historians at £4.95 incl. post per copy inclusive of post & packing. Don't Miss this: Click on the buy-now buttons below to add to your shopping basket. OR WHY NOT BUY BOTH THE PRINTED VERSION AND THE DIGITAL VERSION AT THE SPECIAL OFFER PRICE OF £8.95! That's right. Purchase both editions right now and we will immediately send you a link to the downloadable version so you can be reading it whilst the printed version is winging it's way to you in the post. SPECIAL DOUBLE OFFER: Click on the cyberbook button below to pay with any credit or debit card and be reading The Banned Lecture within minutes for just £8.95 We will also send you the hardcopy printed version by post in a few days time. Crucial extracts concerning Gilles de Rais from Huysmans seminal 'La Bas', a rare classic of Satanic literature. Available nowhere else this latest S.A. edition of The Banned Lecture is a vast improvement. With this you can make sense of what happened to 'the father of modern Satanism' and how it is repeating now, today, as puritanism tries to regain a foothold in our society. You have the choice. You can obtain the 'irreplaceable 'printed collector's edition of The Banned Lecture depicting the original facsimile of Crowley's Lecture (see column to the left, ) which has only ever been available from the S.A.
Crucial extracts from 'La Bas', a classic of Satanic literature. 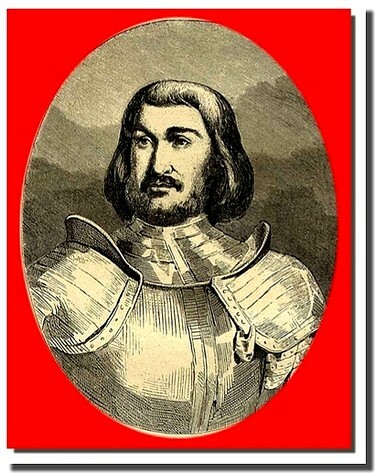 which altogether gives the never before presented true secret history of Gilles de Rais, the 'father of satanism' and his link with Joan of Arc, burned as a witch in 1431. Simply double-click on the file we send you and it will open up on your screen for you to view as many times as you wish. The file is yours to keep and use whenever you want. You can Print it out in full or simply print sections as you wish. Note that unlike some digital publications being offered on the net, once you have paid for an S.A. digital book it remains yours forever and is not timed out. Now when someone mentions 'Bluebeard', you can put them right. Click on the cyberbook button below to pay with any credit or debit card and be reading The Banned Lecture within minutes for just £4.95. Remember, S.A. products are unique and not obtainable anywhere else in the world. When you check-out and pay we immediately supply you with a link so you can download your copy instantly. About Cyberbooks: We have converted some of our best selling Books and Manuscripts into pdf files so you can pay on-line and down-load them instantly wherever you are in the world, in a matter of minutes to read them on your screen. Right Now! Then print them at your leisure! No fuss, no hassle, no waiting for delivery and no airmail costs to boot. Cyberbooks are ideal for clients who live outside the U.K.and have their uses for UK residents who are in a rush or on a tight budget. Also helpful to those who are hard of sight who can enlarge the type on their screen to comfortable levels. And there's no problem with viewing or reading Cyberbooks - if you can see this page then you can read any of our Cyberbooks, guaranteed! Even if the worst happens and your dog pulls the computer lead mid-download you can just reboot and use the link to download again as many times as is necessary. You are allowed to make a backup but we guarantee a replacement even if you inadvertently erase the file (within six months of purchase) - You truly can't lose. Genuine occultism has never been this straightforward and fast - it could only work with a known and genuine, trustworthy business like the S.A. Don't delay your esoteric development, Download The Banned Lecture now and begin your quest into Secret History. Please note that due to technical restrictions your shopping basket for downloadable goods is kept separate to your basket of physical goods. Both baskets will remain active as you surf. When you are ready you can check out each basket separately.